Let's face it, I've never had good brows: they grow like weed all over my brow bone and into my crease, but they're not defined and they're very sparse, with bald spots near the tail. Yet I'm the kind to resist trends for as long as I can just because, so I've been keeping them very natural with only tinted brow gel, and brow powders for special occasions. In times of super defined, dark and razor sharp "insta-brows", I know it makes me look like I've given up on life in some people's minds... 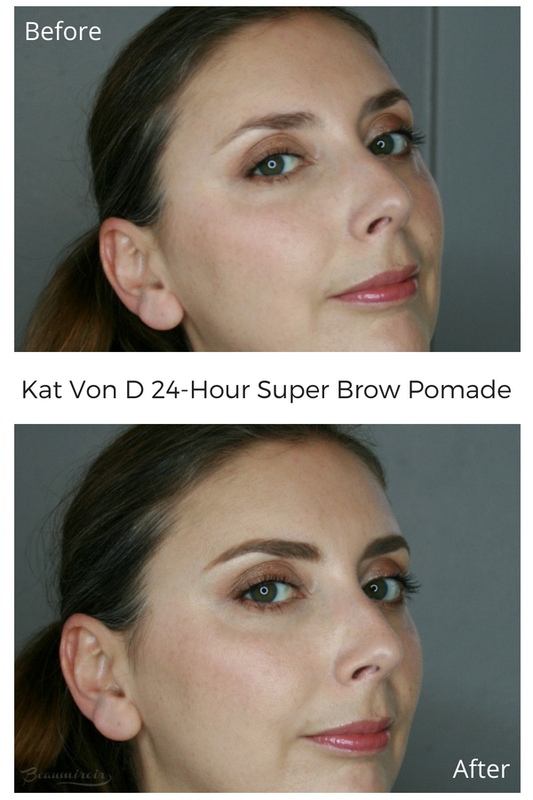 So when Influenster sent me the new 24-Hour Super Brow Pomade by Kat Von D, I thought hey, maybe it's time I finally try to do something about my brows? PLEASE SEE EDIT AT END OF POST. The main reason I never bought a brow pomade before is that I thought it would be too hard to use for me. I'm seriously clumsy and freehand drawing is not one of my natural talents to say the least. So I thought that a very pigmented, very opaque brow product like a pomade couldn't possibly produce decent results in the hands of someone like me. As it turns out, I was totally wrong. Not only do I find Kat Von D's Super Brow pomade very easy to use, I think that it makes it much simpler for me to create a defined, "clean" brow than classic pencils. 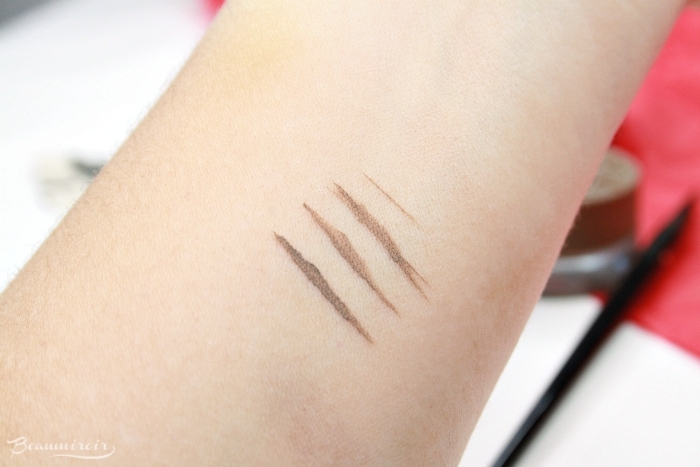 I don't need a stencil, I just need a good thin slanted brush (like the Kat Von D #70 that I also received) and I get Instagram worthy brows in minutes. I thought such a product would be an absolute pain to use, so I'm very surprised that it's so effortless! 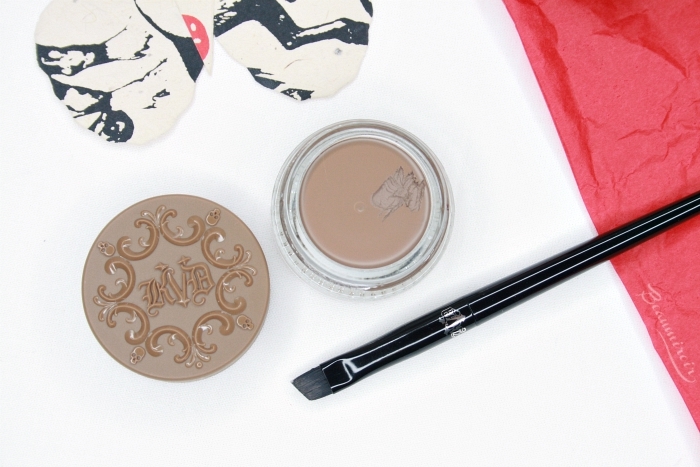 The texture of the 24-Hour Super Brow Pomade is creamy and picks up easily on the brush. I wipe my brush on the inside of the lid a few times to remove the excess product (isn't the design on the lid very pretty too?) and start working on my brows. First I draw the outline on the bottom, then I start filling in. With the combination of this pomade and #70 brush I can do super thin, hair-like strokes, or I can cover a whole bald spot at once by swiping the brush on its side. 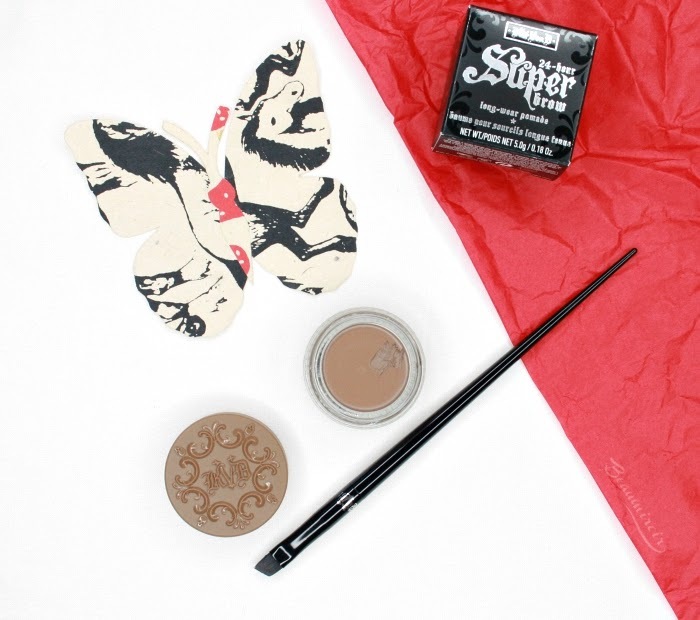 The Super Brow Pomade is very pigmented and I get bold brows even with a light hand. The difference it makes for someone like me who is used to sparse, barely there brows is absolutely amazing! I'm not saying that I'm fully converted to the classic Instabrows look: I don't use concealer to make them even sharper, I don't try to create an ombre effect at the head, and I don't use a shade that's too dark for me... But yes, having well defined brows really brings more structure to my face. The shade I got is Taupe which I think is a very good match for me. In the jar it looks quite light and has a weird yellow-ish undertone. But once applied to my brows it is closer to a true taupe. I really appreciate the fact that it's not too warm toned, as many brow products look way too red on me. This Super Brow Pomade actually comes in tons of shades including unconventional ones like pink, white or green. If you feel intimidated by brow pomades like me but think your brows could use a bit more definition, I can totally recommend this new Kat Von D Super Brow. I can't compare it to any other pomade since it's the first one I've tried, but I was very surprised to find out that it's extremely easy to use. I think it's well worth the $19 price tag, especially since it's very long lasting and budge-proof. EDIT: since I published this review, Kat Von D, the brand's creator, has made some shockingly misinformed comments on social media regarding vaccination. I do not, and will never, support people who use their celebrity as a platform to spread lies, anti-science, and toxic conspiracy theories. Since Kat Von D has decided to preach dangerous behavior, I have made the decision to boycott her brand. I will not give my money to someone who is comfortable endangering the lives of children and vulnerable members of society, and I do not recommend buying any of her products. If you know of a brow pomade that is similar to the one I mentioned in this post, please let me know in the comments so I can find something to replace it with!